Background: The present manuscript describes the synthesis of 3,3-diphenyl propionic acid derivatives. The key intermediate 3,3-diphenylpropionyl chloride was synthesized by the reaction of 3,3-diphenyl propionic acid and thionyl chloride. The 3,3-diphenylpropionyl chloride was further subjected to reaction with various aromatic secondary amines in the presence of potassium carbonate in acetone. Method: After synthesis of compounds, the synthesized compounds were characterized by their IR, 1HNMR, Mass spectral data and elemental analysis. These derivatives were screened for their analgesic activity (Hot plate and tail flick method) and anti-inflammatory activity (Carrageen induced rat paw edema and Egg albumin induced rat hind paw oedema method) by using Diclofenac sodium and Indomethacin as standard drugs, respectively. Results: The compounds AK-5 and AK-3 exhibited significantly potent anti-inflammatory and analgesic activity (two to three times) when comparison was made with control group. The response of promising compound (AK-5) for analgesic and anti-inflammatory action was highest among all the test compound and was almost similar to the standard compounds (Indomethacin and Diclofenac Sodium). 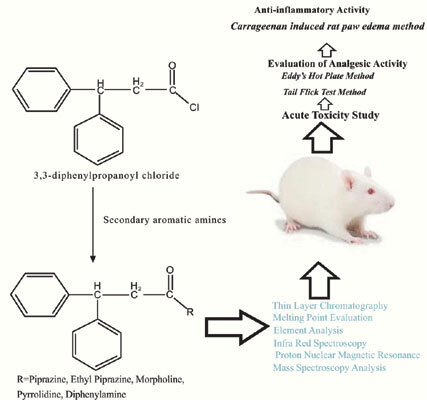 Conclusion: The findings of this work verify the potent action of AK-5 compounds as analgesic and anti-inflammatory activity in experimental animals. Keywords: Aryl propionic acid, toxicity, analgesic activity, anti-inflammatory activity, indomethacin, carrageenan induced rat paw edema. Keywords:Aryl propionic acid, toxicity, analgesic activity, anti-inflammatory activity, indomethacin, carrageenan induced rat paw edema. Abstract:Background: The present manuscript describes the synthesis of 3,3-diphenyl propionic acid derivatives. The key intermediate 3,3-diphenylpropionyl chloride was synthesized by the reaction of 3,3-diphenyl propionic acid and thionyl chloride. The 3,3-diphenylpropionyl chloride was further subjected to reaction with various aromatic secondary amines in the presence of potassium carbonate in acetone.